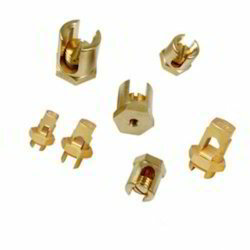 Our clients can avail this range of Brass Panel Board Accessories have been in wide demand by many of our industrial patrons for the quality that we offer in this. Best grade material has been used in the making of this range, and we have developed this range for all types of electrical switch gears and control panels. stringently best quality brass has been applied in the making of this range. For a durable finish, nickel plating has also been done over these accessories. Made to offer complete security and safety, the offered range of this Brass Panel Board Accessories has been appreciated for its dimensional accuracy and standards of manufacturing. Given a sophisticated and long lasting nickel plus tin plating, the accessories are made for compatibility with all types of switch gears, control panels and switch boards. Made to offer complete and easy installations, the offered range of these Brass Reducer has been made to perfection and completely accurate in dimensions. In this range we have various kinds of sizes available and complete adherence to industrial standards has been made. Customers from various industries can avail this range from us in legitimized prices.